In one of my last blog posts on God's Politics, I had some pretty strong opinions on the negative comments made by Bernard Hopkins about Donovan McNabb implying that McNabb was not "black enough." This week I would like to highlight the other side of the issue by praising Bishop T.D. 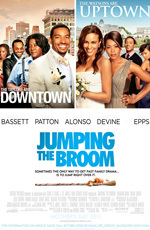 Jakes and the film Jumping The Broom. My wife and I go see a lot of films, and we enjoy dissecting them afterward. This week we decided to go see this one, produced by T.D. Jakes. I must say I was very skeptical going into the film for reasons I won't go into now, and while the film was not life changing and had a few scenes that were a stretch, I thought, overall, the way it characterized black men was refreshing. There was a positive image of black men throughout the film that is very rarely seen in Hollywood. The film also covered a number of diverse issues in the black community with grace and dignity. I left the film feeling like the black men who love their families, treat their wives well, and even sacrifice for others were given a voice in the film -- a rare treat for sure. The film was not full of buffoonery or thugs; it captured an essence of black culture that I feel gets overlooked in many cases. The film presented some hard issues with care. It did not answer hard questions, but it did leave room for dialogue. I have seen better films, and experienced much greater acting performances. I have left theaters in tears some nights and in rage on others. I have felt embarrassed some evenings at the way black men were portrayed, but rarely have I left feeling fulfilled. This film touched a a good part of my soul. If you get the chance, go check it out. If you have never seen black men portrayed in this way, go see it. If you have never seen a positive image of yourself, go see it. If you need to change your image, let this movie get you on the right path. Leroy Barber is president of Mission Year, a national urban initiative introducing 18- to 29-year-olds to missional and communal living in city centers for one year of their lives. He is also the pastor of Community Fellowships Church in Atlanta, Georgia and author of New Neighbor.